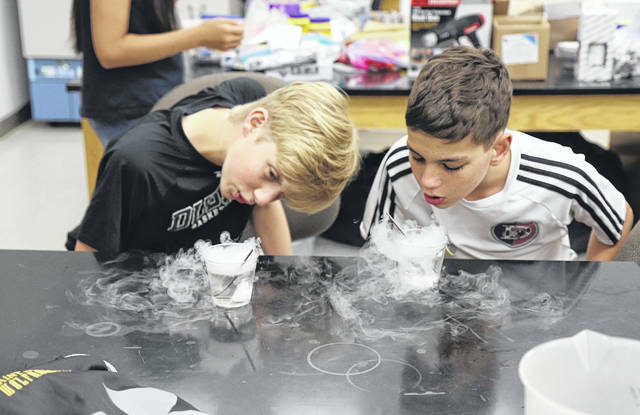 Ohio Wesleyan’s OWjL Camp brings together middle school students from 10 central Ohio counties for classes such as “You Are What You Eat,” which the above students are pictured taking part in. The program has earned its second consecutive grant from the Ingram-White Castle Foundation. The Ingram-White Castle Foundation is awarding Ohio Wesleyan University’s OWjL Camp a three-year, $11,250 grant to provide scholarships for talented and gifted middle school students selected to attend the weeklong academic camp. Each summer, Ohio Wesleyan hosts three weeklong residential sessions of OWjL Camp for sixth-, seventh-, and eighth-grade students from Delaware, Fairfield, Franklin, Knox, Licking, Madison, Marion, Morrow, Pickaway and Union counties. Students attending OWjL Camp select courses from an academic program that includes mathematics, logic, computing, science, humanities, and creative development. Cultural, recreational, and social activities round out the experience. OWjL was created following a two-year study that determined talented and gifted middle school students were underserved during the school year with programs to promote discovery and foster skills in problem-solving, critical thinking, creativity, research, leadership, and communication. Learn more at www.owu.edu/owjl. The Columbus-based Ingram-White Castle Foundation supports programs that serve disadvantaged students and help them achieve academic success; help prepare students for the world of work; strengthen educational institutions; and address critical human service needs. Learn more at http://ingramwhitecastlefoundation.org.